The FeaturesSome tips and suggestions about drawing the elements that make up the face. This month the nose. Forthcoming Exhibitions Details of current exhibitions in London which have just opened booking. (on Trigonos)"Really enriched! Learnt negative space, angles, shading etc - the whole works!! I have started 'seeing' for the first time!!! All Great! 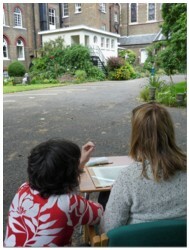 Great location, ambience, food...."
Over the next couple of months I'll look at drawing the individual features. Typical challenges to overcome and the common pitfalls. Sight the length of the nose in relation to your basic unit. Keep checking it throughout your drawing as it can often be extended or reduced subconsciously! Check the relationship of the length of the nose to the length of ears on your model. Noses are wider than you think! People commonly draw the noses much too narrow. Sight the width of the nose by checking the relationship of the widest point with something like the pupils of the eye above. Do this both sides. Break down the areas of the nose into light and dark ie the plane under the nose is most likely to be in shadow (but it depends on your lighting) so if you block in this overall plane with shadow shape you can then work further darks or erase out lights as necessary. Block in the other planes of the top and the side planes. The side planes in particular are important for determining depth in your portrait. Look for the core or crest shadow – the darker line that runs down the nose where the plane turns away from the light. If this is present don’t be afraid to put it in – it is vital in making the nose look three-dimensional. Avoid putting in the nostril openings too early – people commonly put in very dark circles here which are simply symbols of nostrils – you must observe the shapes you see in terms of light and shadow. The shape of the nostril is unique and important in catching a likeness so draw what you see and don’t go too dark with the nostril. Often a suggestion of a nostril is more effective than actually being very precise and heavy with it. Look for negative shapes of light and dark all the time. If you find yourself falling into the ‘symbol trap’ work on another part of the drawing and come back to this bit later. Remember to sight carefully the distance between the bottom of the nose and the top lip – this is the philtrum. People often make this much too long so check the relationship carefully.